Are fallen arches a real foot problem, or just a label for chronically sore feet? Fallen arches --or flat feet-- are a legitimate medical condition affecting five percent of Americans. Flat feet can be present at birth, or develop over decades of walking, running and overall time spent on the feet, especially on hard surfaces in the workplace. There are several types of flatfoot conditions that occur in adults. The most common type is adult-acquired flatfoot. It is caused by overstretching a tendon that supports the arch. 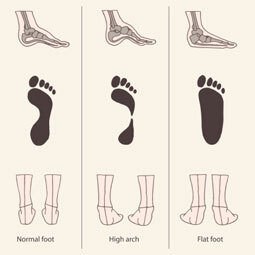 Another common type is flexible flatfoot, in which the foot is flat when standing, but returns to a normal arch in non-weight-bearing positions. Flat feet can be very painful and make people avoid walking, running and exercise, but if you seek medical attention early, a foot and ankle surgeon may be able to prevent it from becoming a more serious foot problem. Treatments for this condition may include modification of limiting activities, stretching exercises, custom shoe inserts and non-steroidal anti-inflammatory medications. If those techniques don't work a variety of surgical procedures may be considered to relieve pain and improve foot function. For more information about flatfoot treatment or other painful foot conditions, please call 1 of our 3 offices, for more information or a consultation. As we get older, many people write off little aches and pains that come and go as a part of the normal aging process. However, sometimes listening to those pains is important. This is especially the case in regards to pain experienced in the legs: This could be a sign of peripheral artery disease. Peripheral Artery Disease (PAD) is a disease that affects more than 8 million people in the United States. It occurs when plaque builds up and causes narrowing of the arteries. This can restrict blood flow to muscles and organs. It is most common in the legs and pelvis but can be present in other arteries such as those to the brain, bowel and the kidneys. According to The American Heart Association, people with peripheral arterial disease have 4 to 5 times more risk of heart attack or stroke. You are at a greater risk for PAD if you smoke, have diabetes, high blood pressure or high cholesterol. PAD can be life threatening and can lead to complications like kidney failure, gangrene and limb amputation if left un-treated. The most common symptoms are: Painful cramping in the hip, thigh or calf muscles after activity, such as walking or climbing stairs (intermittent claudication) Leg numbness or weakness Coldness in the lower leg or foot, especially when compared with the other side Sores on the toes, feet or legs that won't heal A change in the color of the legs Hair loss or slower hair growth on the feet and legs Slower growth of toenails Shiny skin on the legs No pulse or a weak pulse in the legs or feet Erectile dysfunction in men If peripheral artery disease progresses, pain may even occur when at rest or when lying down (ischemic rest pain). It may be intense enough to disrupt sleep. Hanging your legs over the edge of the bed or walking around your room may temporarily relieve the pain. It’s important to talk to your health care provider if you notice any of the signs and symptoms listed above. Your provider will review your family history, conduct diagnostic tests and perform a physical examination that will determine if you are at risk. Hammertoes occur when the smaller toes of the foot become bent and prominent. The four smaller toes of the foot are much like the fingers in the hand. Each has three bones (phalanges) which have joints between them (interphalangeal joints). Normally, these bones and joints are straight. A hammertoe occurs when the toes become bent at the first interphalangeal joint, making the toe prominent. This can affect any number of the lesser toes. In some cases, a bursa (rather like a deep blister) is formed over the joint and this can become inflamed (bursitis). With time, hard skin (callous) or corns (condensed areas of callous) can form over the joints or at the tip of the toe. There are many different causes but commonly it is due to shoes or the way in which the foot works (functions) during walking. If the foot is too mobile and/or the tendons that control toe movement are over active, this causes increased pull on the toes which may result in deformity. In some instances trauma (either direct injury or overuse from walking or sport) can predispose to hammertoes. Patients who have other conditions such as diabetes, rheumatoid arthritis and neuromuscular conditions are more likely to develop hammertoes. These are unlikely to resolve established deformity, however can help reduce discomfort to the ball of the foot. The only effective way of correcting the deformity is to have surgery. What does surgery for this deformity entail? Tendon transfers involve taking the tendon from under the toe and re-routing it to the top of the toe so that the toe is pulled down. Digital arthroplasty and arthrodesis involve the removal of bone from the bent joint to allow correction. An arthroplasty removes half the joint and leaves some mobility whilst an arthrodesis removes the whole joint leaving the toe rigid. In more severe cases, the tendon on the top of the toe and the joint at the ball of the foot may need to be released to allow the toe to straighten. If there is severe stiffness at this joint, the metatarsal may need to be shortened using a Weil osteotomy. If you are suffering from hammertoes and would like more information please visit our website for more information www.robertweaverdpm.com or call the office 440.442.3113 to schedule a consultation.